Upon entering the Tjhung family residence, you are immediately greeted by a majestic yet homey feeling. Two grand staircases, one on each side of the building, and three Mother Theresa crystal chandeliers welcome you when you walk inside. The house is dominated by neutral colours, such as white, beige and grey, with brush gold accents. Two ceiling-to-floor windows overlook the swimming pool at the back. 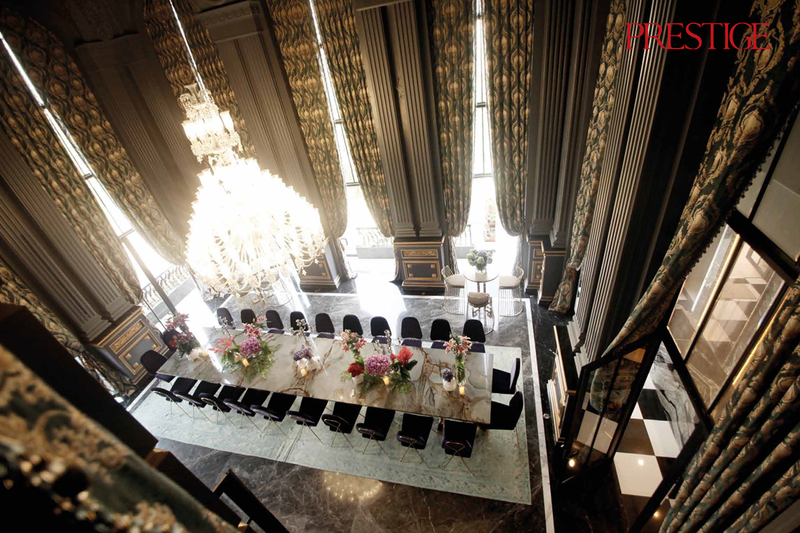 The right wing takes us to the pantry, a beautiful tea room and a grand dining room. As for the property’s left wing, that’s where the master bedroom resides. The Art-Deco style house is filled with sculptures of Greek goddesses that add to the style of the house. Situated in North Jakarta, the property was designed and built by the youngest of six siblings, Lio Tjhung. While he has never received any formal training in interior architecture, Lio honed his space design experience by previously completing several of his own apartments’ interior projects before putting them on lease. Lio feels like art and design are his true passion. “Being a visual person, any form of design really interests me, from graphic design to fashion as well as interior design,” he says. “My daytime job in the garment business also requires me to do a great deal of fashion designing, so that may contribute to my creativity.” Lio earned a degree in Business Computer Information Systems from Hofstra University in Hempstead, New York. Soon after graduation, Lio spent two years gaining experience as a graphic designer and web developer for a US based tech company. He came back to Jakarta in the year 2000 when his parents summoned him for a more active role in managing the family’s growing garment business. He has been managing the company, largely responsible for design and production for the last 18 years since his return from New York. Putting comfort above everything for the family, the 2,000 sq m house has its own basement – specially built for entertaining the family members. A long corridor leads to the entertainment room, a spa room complete with salon and massage room, an office, another living room for guests, as well as a dedicated library and a service area for the help staff. “I designed the house from scratch. It’s inspired by all the grand homes and cozy hotels I’ve had the opportunity to stay in during my travels. A great deal of inspiration also came from images on social media, such as on Instagram and Pinterest, and from watching period dramas and even some modern-day movies. And yes, I do spend a lot of time on social media and watching movies – all in the name of research,” he explains with a grin as we walk around an area that feels nothing like any ordinary basement. The second level of the house is dedicated for visiting family members’ bedrooms and one formal guest bedroom. Then we move on to the third level. This is occupied by a penthouse and a rooftop garden where guests can enjoy a green scenery and the city’s skyline. The second master bedroom is on this level, complete with walk-in-closet and master bathroom. Lio has a soft spot for dogs – he has a 5 and growing stable of Shelties, to be exact – and he has put his furry babies in their own room on the third level. Again, with the functional theme of the house, this level completed by a kitchen, pantry, living room and children’s room.